In his first public appearance after getting bail, Arun Ferreira, alleged Naxalite, spoke about the plight of political prisoners in India, at an event held by the Committee For Release of Political Prisoners in Mumbai yesterday. Amidst a jam-packed hall swarming with journalists and activists, Mumbai-based Arun Ferreira, alleged Naxalite, made his first public appearance after he was released on bail from Nagpur jail recently. Ferreira, after returning to Mumbai, had refused to speak to the media. This much-awaited press conference came almost a week after his release. The event was organised by the Committee For Release of Political Prisoners at the Press Club in South Mumbai, yesterday. While shutterbugs clicked away, Ferreira took his position on the dais along with other members of the committee. 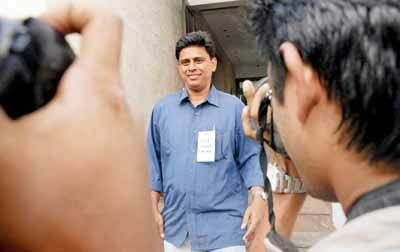 Dressed in a blue jeans and a blue shirt, a small card dangling from his shirt pocket read FREE SUDHIR DHAWALE. The purpose of the event was to inform the media about the plight of political prisoners and eventually call for their release. “I have come here to highlight the plight of political prisoners in our country. Who are these political prisoners? Sudhir Dhawale is one of them. He was arrested in Gondia because the police claimed that he supports Naxalism. The evidence against him was a book, which he had written some six years ago. This book was used as evidence against him. Is this democracy?” asked Ferreira.